The world’s biggest chip-maker-for-hire makes good on its solar bid. A trend to come? Taiwan Semiconductor Manufacturing Co., which has been sniffing around Silicon Valley for solar and LED deals, is getting into CIGS. TSMC has put $50 million into Stion, a somewhat secretive solar module maker that wants to generate power with solar cells made with copper indium gallium selenide (CIGS) -- and follow that up in 2011 with a tandem module that can generate solar power with CIGS panels and another layer that can generate more power with solar cells containing chalcopyrite. It's two solar cells in one! There are a couple of trends wrapped up here. First, TSMC is one of the Asian giants like Samsung, LG and Panasonic that has begun to push into green. TSMC's venture group has been in somewhat regular contact with VC firms on Sand Hill Road for a few months now and has said it will invest $50 million in solar. The company has also been recruiting executives for its new energy division. Last year, it bought a 20 percent stake in Motech, a solar cell maker. With the chip market down, companies with big factories have to do something. Second, this move illustrates how small companies are trying to partner with established players. With relatively little capital to go around, Stion, among others, needs to find big brothers with manufacturing capacity. TSMC is the largest foundry, or chip manufacturer-for-hire, in the world. 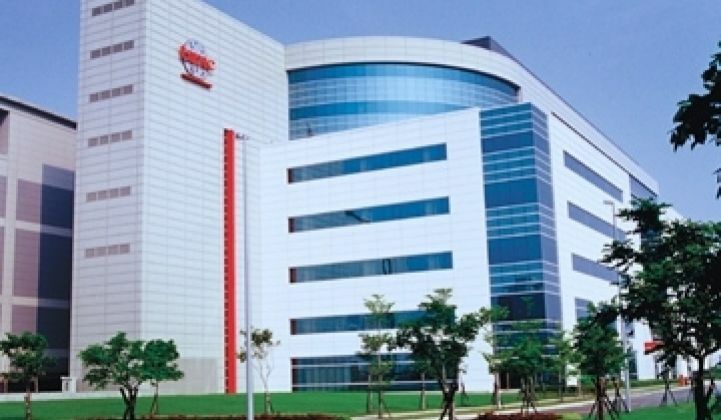 Third, part of the deal contemplates licensing, so one could imagine TSMC serving as a manufacturing backbone for other solar cell designers. Stion produces its cells on industry standard equipment for the most part, so a lot of the manufacturing equipment used is already familiar to TSMC. The idea behind the tandem module is that the CIGS layer and the more unusual layer can harvest energy from different ranges of the spectrum of light. Ideally, this will let the combined panel produce more energy consistently during a single day. Prototypes of the tandem cell have an efficiency of around 15 percent, while the CIGS cells have a circuit efficiency of around 13 percent. One tool for making the CIGS panel and one tool for making the other cells has been customized, but everything else basically comes from the basic lines of equipment makers, which lowers manufacturing costs. "We've always had this pursuit of a tandem," he said. The modules are on glass substrates. At volume manufacturing levels, Stion will produce CIGS and tandem junction modules for less than $1 a watt, he added. The low price comes in part from the manufacturing equipment strategy, as well as from the design of its CIGS modules. The cells in the module do not have to be strung together independently. "From a capex point of view, it will be less than a dollar per watt," Farris said.